I have never paid much attention to scones–I don’t even remember the last time I had them, but it all changed when I was on my cruise vacation. Being on a giant ship 24 hours x 9 days—mostly sea bound—means that the best past time on board was to eat. Every afternoon, I had scones for my afternoon tea, and of course, a crepe or two. And then one fine day, I fathomed that scones are such great things to eat—under the shade on the deck overlooking the azure blue sea—over a cup of tea or tea. So, that was how I discovered them and marked the start of my love affair with scones, especially raisin scones. I have always loved raisins and in this recipe, raisins give that extra sweetness and add moisture to the scones. Pre-heat the oven to 400 F. Combine the flour, sugar, baking powder, and salt. Add in the butter until mixture resembles coarse crumbs and then follow by the egg and vanilla. Add in the milk slowly. If the dough becomes too sticky, stop adding the milk, instead add a little more flour to form the dough. Stir until the dry ingredients are moistened. Add in the raisins. Roll out the dough on floured surface to 3/4-inch thickness. Using a 2-inch round cookie cutter, cut out the scones. Gather the scraps; reroll and cut out additional scones. Place the scones on prepared baking sheets, spacing apart. Brush egg yolk over the tops of the scones. Bake scones until golden brown, about 15-20 minutes. I love scones with homemade strawberry jam, esp those from Smokehouse in Fraser’s Hill. Thanks for bring back the memories. Have not been there for 5 years. Those from Cameron Highlands are not the same. Hope to try your recipe. what a yummy looking scones… stop waving at me.. OK?!!.. …… hee hee hee hee …. Being an Aussie, I love scones. Yours look great and nice and moist. was wondering if u could link my blog n promotte my cupcakes!!! Annie makes some awesome scones. They’re very popular with all our friends. Way, way better than the kind you can get in Cameron Highlands. We’ll have to blog about ours soon. i love em with really good homemade strawberry jam and clotted cream. one of the most relaxing, comforting things ever. true, scones don’t register for 99.9% malaysians ! u r awesome!! i like to read ur blog SO MUCH!!! it inspires me not to give up my hobbies..
i noticed that u stated ‘teaspoon of vanilla extract’..may i know if it’s 1 teaspoon or wat? please guide.. thanks..
Hi Anonymous – I don’t use grams or ozs that much as most people do not have a scale at home, but many home cooks have measuring cups at home. Sorry for the inconvenience. I tried your scones recipe last night. However, I had trouble with the dough. I followed the recipe word for word but when I got to the dough part, it turned out really sticky, so I couldn’t roll it out and use the cookie cutter. It still taste good nonetheless. Maybe you could explain to me the methods even clearer. I’d very much like to try it again. Roselyn – try adding more flour as you knead the dough. This should help. I made this recipe today, however when I tasted it there was way too much baking soda. It was disappointing because they looked and smelled so good. I was just wondering if perhaps it is 1 teaspoon of baking soda rather than 1 tablespoon? I followed the recipe exactly. Thanks for your help!! Chelsea, you used the wrong ingredient. It’s 1 tablespoon of baking powder, not baking soda. I am planning to try this out soon – I see from other recipes that 1 tablespoon of baking powder is just about right. As baking soda differs from baking powder, I suppose 1 tablespoon of baking powder will work? Hi, Would you mind to clarify if your recipe calls for baking powder or baking soda and the corresponding amount required? Hi Anita, it’s baking powder as stated in the recipe. I have tried your recipe yesterday, as for the sticky dough, I added little bit of flour. Result was very yummy. Will definately use in future! I would like to bake the raisin scones. Do you have the measurement in grams ? flours? sugar? milk? Or are using measuring cups to measure all those ingredients? For those looking for different measurements..you can google search for a measurement converter app that will easily help you do the conversions. Hope this helps! hello, i would like to ask, whether can i use low protein flour instead of plain flour? You might need high gluten flour for this. To prevent the sticky dough, instead of adding additional flour, can we reduce the amount of milk? If not, how much more flour do we add on at the end? Would like to give a try soon ;o). Hi Bee, was just wondering, instead of softened room temp butter, do you think I can use melted butter? can you recommend me other kind of flour besides all purpose flour? Tried your Raisin Scones Recipe – came out light, fluffy and moist – just delicious! However, I made a slight variation – added 1 tsp of cinnamon and used 1/3 cup of sour creme and 1/3 cup of whole milk. Your recipe is a “Keeper “! 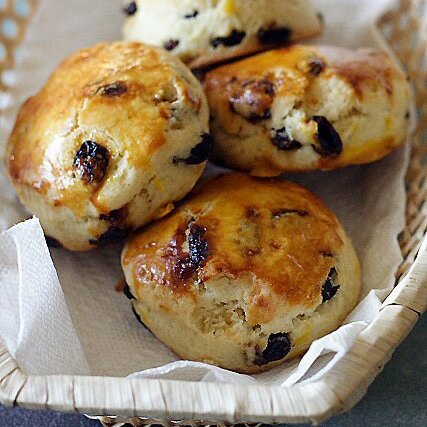 Thanks Rae, great that you love this raisin scones recipe. Oh I forgot to mention that instead of slightly kneading the dough – I just used a 1/2 cup measuring cup to drop it on the baking sheet lined with parchment paper. Just made these, they are hot out of the oven and the aroma is so inviting! I have my tea brewing and can’t wait to dig into one of them. I followed the recipe EXACTLY, and used not quite 2/3 of cup of milk. I made it in my Cuisineart and just pulsed it about 5 times to mix first dry ingredients, then added the cold butter pieces and pulsed 5 times, then the beaten egg, vanilla, and 1/3 of the cup of milk and pulsed 6 times, then added a little more milk until the flour started to just pull away from the sides and then the raisins. It was crumbly, and perfect, when I gathered up the dough it was just perfect. I took a taste and WOW! This is my go-to recipe from now on. It couldn’t be simpler. Hi, how many scones does your recipe make? I am trying to adjust it to 4 scones as it is only for my husband and I. Thanks! The scones are amazing. I plump my raisins before using, so I did add an additional small handful of flour to the dough. Rather than roll them and cut them I form the dough into a square about 9×9 or so. Then I cut it into 4 squares and then each one is cut corner to corner to make triangles. Makes an easy dozen! Have tried MANY raisin scone recipes but yours is the best and easiest by far, however i did try adjusting some ingredients for a drier,crumbly less cake like scone, 2tbs Bakung powder, more sugar 1/2 cup and less milk 1/2 cup. Wish they would rise more though so to slice in middle and support jam and cream. Great website! Hi Ruby, thanks for trying the raisin scones and liked the recipe. These are in the oven as I type. So far, so good. For people having trouble with the dough being sticky make sure you use cold butter when mixing with the flour. Just use your hands and work it in until crumbly. Add the milk slowly until right consistency. Mine resembled cookie dough. I had a tablesppon or so milk left over. Turn onto lightly floured surface and light dusting on top. I rolled into a circle and cut into 8 triangles. I sprinkled a little sugar on top! I recommend whole milk and organic eggs, butter and milk if possible. Definitely whole milk though. Almost done, they look awesome! I have probably made the 50 times – and they are always delicious! I have passed on the recipe dozens of times. By far one of my favorite all time recipes. Just got asked by a neighbor if I would make several batches for her for her wedding day breakfast! I know the Scones are going to be good as they just came out of the oven, look wonderful and smell even better, and have yet to make anything of yours that hasn’t been a keeper and been made more than once. Thanks for all your great recipes Rasa! Hi Rhoda, thanks for trying my raisin scones. Hi Wendy, good to know. Thanks for letting me know! HI, I’ve just made these delicious scones. My scones are beautiful but have a thin layer of baked egg yolk across the top where I brushed it and in the picture yours look golden. Did you add water, milk to your egg yolk? Thanks! Yes, you can add some oil and a little condensed milk for egg wash to give it that golden brown sheen. It’s not necessary, though.